Strength training by NMES does promote neural and muscular adaptations that are complementary to the well-known effects of voluntary resistance training".This statement is part of the editorial summary of a 2010 world congress of researchers on the subject. Additional studies on practical applications, which came after that congress, pointed out important factors that make the difference between effective and ineffective EMS. This in retrospect explains why in the past some researchers and practitioners obtained results that others could not reproduce. Also, as published by reputable universities, EMS causes adaptation, i.e. training, of muscle fibers.Because of the characteristics of skeletal muscle fibers, different types of fibers can be activated to differing degrees by different types of EMS, and the modifications induced depend on the pattern of EMS activity. These patterns, referred to as protocols or programs, will cause a different response from contraction of different fiber types. Some programs will improve fatigue resistance, i.e. endurance, others will increase force production. Powerful Function: ABS for abdominal muscle training, BODY for body partial exercise. Adopt 10 different levels of intensity from warm-up to high-intensity exercise and finally to relaxation:fat burning, relaxation and exercise. 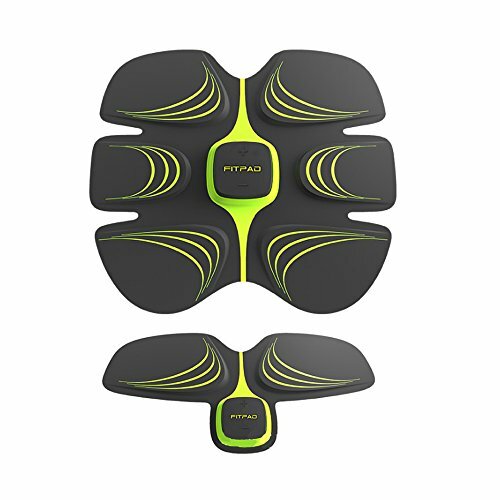 20 Minutes Per Day: Exercises with Fitpad 20 minutes equal to 1500M running or Swimming/sit-ups 30 minutes.15 grade force/ 6 modes optional, one key fitness. Please follow the manual and be patient. If you have any questions about this product by ABS Fit, contact us by completing and submitting the form below. If you are looking for a specif part number, please include it with your message.